Library image #4089: Unlike most of the wilderness, the southwestern portion is characterized by gentler slopes. The United States Congress designated the Mt. Charleston Wilderness (map) in 1989 and it now has a total of 56,819 acres. All of this wilderness is located in Nevada and is managed by the Bureau of Land Management and the Forest Service. The Mt. Charleston Wilderness is bordered by the La Madre Mountain Wilderness to the south. The Mt. Charleston Wilderness is an inspiring place with invigorating mountain air, ice-cold springs, and acres of noble evergreen forests. The rugged mountain scenery extends across the crest of the Spring Mountains and includes towering crags, deep and wide canyons, narrow slot canyons, and steep hillsides. It includes Fletcher Canyon, Robbers Roost, and Mummy and Trough springs. Mt. Charleston is knows as a "Sky Island" because of its high elevation and isolation from the drastically different desert lowlands. Elevations range from about 4,440 feet on the lowest slopes in the southwest part of the wilderness area, to nearly 12,000 feet at the summit of Mt. 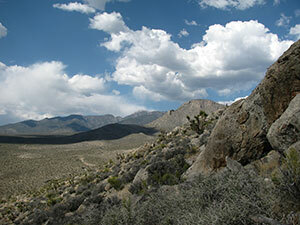 Charleston Peak, the highest elevation in the Spring Mountains. The Mt. Charleston Wilderness the most extensive stand of bristlecone pine (Pinus longaeve) to be found in the intermountain ecoregion. These trees are valued for their aesthetic and scientific purposes and are among the oldest living organisms in the world. In lower elevations, extensive forests of ponderosa pine and white fir provide habitat for the Palmer's chipmunk, a species that only occurs in the Spring Mountains. There are acres of Pinion-Juniper Woodland bright with 15 endemic mountain flowers such as the Charleston Mountain angelica (Angelica scabrida) and booming with wildlife. About 40 miles of trails cross this area, traversing significant elevation from trailheads to ridge lines. From this back-country, vistas can be seen across the mountains and valleys in the area that seem to reach to the edge of the world. The Mt. Charleston Wilderness area was originally part of an area known as the Charleston Forest Reserve established on November 5, 1906 by President Theodore Roosevelt under the authority of the Forest Reserve Act of 1891. Today, the Mt. Charleston Wilderness consists of Federal Lands located predominantly within the Spring Mountains NRA and part of the Humboldt-Toiyabe National Forest outside of Las Vegas, Nevada. Planning to Visit the Mt. Charleston Wilderness? How to follow the seven standard Leave No Trace principles differs in different parts of the country (desert vs. Rocky Mountains). Click on any of the principles listed below to learn more about how they apply in the Mt. Charleston Wilderness.